The county will be running a First Aid CPD event at Sir Christopher Hatton School in Wellingborough from 9.00.am until about 5.00.pm on Saturday 19th May 2018. This is a First Aid for Archery course with emphasis on problems you might encounter on the range/field. The full event is all day, but for those who might not be able to manage this there is a limited option to join in after lunch for some of the pertinent bits. There is no cost to attendees and possibly room for experienced archers who are not actually coaches but who would benefit from some First Aid instruction. Please therefore mention the session to others in your club. If you are interested in attending please contact John Marshall. John Marsall (NCAS County Coaching Officer) has organised a Sport Psychology Workshop on Saturday 13th May 2017. This is a four hour event, beginning at 10.00.am, and will be held at Montsaye Sports Academy, Greening Road, Rothwell. 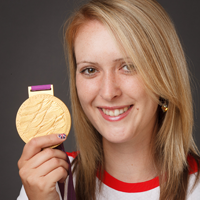 The presentation will be made by Danielle Brown M.B.E., who is a qualified sports psychologist and two times, Paralympic archery gold medallist. This presentation is open to all the counties coaches and all participants will receive a workbook that they will go through during the session and can use as an ongoing resource. There is no cost to the attendees. While this workshop is aimed at, and primarily intended, for coaches there are some spaces available for archers who are interested in this aspect of the sport. This event is limited to twenty places which will be allocated on a ‘first come – first serve’ basis, so please advise John Marshall as soon as possible if you would like a place. On Sunday 7th September, the Northamptonshire team competed in the 56th EMAS Senior Inter-county Team Tournament, otherwise known as The Thoresby Shoot. Individually our archers shot extremely well, with several personal best scores achieved on the day. Five of our seven gents recurve archers, finished in the top eight. Shahram Montasser of Kettering Archers won the gents recurve, John Inkley of Nene Bowmen came third, Ian Hannaford of Northampton AC was fourth, Jeremy Beesley of Branbury Cross Archers was fifth, and Dean Edwards of Duston Bowmen came eighth. Simon Stubbs of Branbury Cross Archers finished in 14th place, and Simon Wright of Wellingborough OAC came 17th. So all in the top half of the results. James Mason of Northampton AC won the gents compound with a new county record score. Team Captain Martin Ross of Long Buckby AC finished in seventh. In the ladies recurve, Christine Marshall of Wellingborough OAC came 15th scoring a new personal best. Jennifer Ives of Banbury Cross Archers also shot very well in 19th place. Anita Stubbs also of Banbury Cross Archers finished 22nd shooting barebow. Our two Longbow archers, Russell Faulkner and John Marshall finished 7th and 10th respectively. As we were unable to field full teams for most of the categories. we weren’t able to challenge for any of the team trophies this year, finishing 5th in all three categories. Derbyshire won both the recurve and the compound trophies, with Leicestershire & Rutland winning the Longbow trophy. This year, the shoot also acted as a selection shoot for the up coming EMAS Senior Team match against the West Midlands, to be held on 12th October at Lilleshall. NCAS members initially picked for the team are: Shahram Montasser, John Inkley, Ian Hannaford, Jeremy Beesley, Dean Edwards and James Mason. Congratulations to those archers.